January 9, 2018 - Rabbi Raziel Shevach of the West Bank settlement outpost Havat Gilad, was killed tonight in a drive-by shooting on the road near his home. Rabbi Raziel Shevach, 35, father of six of the West Bank settlement outpost Havat Gilad, was killed tonight (Tuesday, 9 January 2018), in a drive-by shooting in the road near his home. He was fatally wounded when terrorists opened fire on his car. Security forces rushed him to the Meir Hospital in Kfar Saba, where he was declared dead. Rabbi Shevach was a mohel (a rabbi who performs circumcisions in accordance with Jewish law). He was also a volunteer in Magen David Adom (MDA). 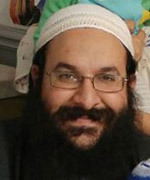 Raziel was remembered by friends and acquaintances as a goodhearted family man who was a central figure in the local settlement community and in his home of Havat Gilad. He will be laid to rest tomorrow (Wednesday) in Havat Gilad, in accordance with his wish to be buried in the settlement. He is survived by his wife Yael and their six children.